I have been wanting to experiment with puff pastry, and now on holidays, I have the time and space to get some practice in. Hence this apple and almond tart. This tart is made with rough puff pastry. It’s still a little fiddly to make, but not quite as time-consuming as real puff pastry. However, unless you’re in the mood for some rolling and folding, you can just as well use good butter puff pastry, ready rolled, from the supermarket. There are plenty of good recipes for puff and rough puff pastry if you want to go down this route. James Morton in How Baking Works and Paul Hollywood in How to Bake both take you through the process. And with all the diagrams too! So I’m assuming you will use the good store-bought stuff, or follow the directions of one the afore-mentioned Baking Aficionados! I put an almond sugar filling in the tart before arranging some red apples in slices, with skin, on the tart. The almond mixture is not quite a frangipane as it has no butter. But you still end up with a rich almond paste on which to rest the apples. Raw or ordinary caster sugar to scatter over the tart. To make the almond filling combine the ground almonds and sugars in the bowl of food processor. Add the almond extract and enough of the beaten egg to make a paste. The paste should be just firm enough to spread/ease into your pastry base. Core and slice the apples thinly, and place the slices into the lemon juice to stop them going brown. Roll out your chilled pastry, and cut a large circle, using a dinner plate as a guide. Place the circle on baking paper on a baking tray. Score the circle with another circle, 2cm inside the outer edge. This will give your tart an edge. Prick all over with a fork. Place the almond mixture on to the pastry, leaving the outer 2cm circle free. Don’t worry if it doesn’t quite cover the pastry, just do your best. rough is OK. Drain the apples slices and place in any artistic way you like on the tart. Brush the 2cm edge of the tart with the rest of the beaten egg. Scatter the caster sugar over the tart, apples and the edge, but making sure the apples get a good covering. Place the tart in the oven and bake for about 20 minutes. The tart should be golden brown, and puffy round the edge. Serve warm or cool with plenty of thick cream! Posted in Dessert, Pies, Tarts and Quiches, Sweet Food and tagged almond paste, James Morton, Paul Hollywood, rough puff pastry. Bookmark the permalink. Ciabatta is that lovely bread distinguished by all those holes! It’s light and flavoursome, keeps well and is also amazing toasted or made into bruschetta. In need of a reliable recipe, I consulted James Morton in his great book Brilliant Bread for how to make this bread. I was making ciabatta for the first time this week. I had friends over for dinner to celebrate the arrival of a shearers’ table which has been sojourning in the Southern Highlands for too long. I had hot-smoked a side of salmon and wanted some nice bread to serve it with. I ended up serving it with dill pickles, creme fraiche, focaccia and the ciabatta loaves. Here’s a photo of the hot-smoked salmon. For the recipe on how to hot smoke, check the recipe from my post on hot-smoking. Ciabatta can be tricky to make as the dough is very wet and hard to handle, so be prepared for this. James suggests using the paddle attachment of an electric mixer, which makes the kneading easier. I discovered that James has a simpler recipe online. It looks good, and I am keen try his “pared down” version. See James’ simple ciabatta here. But here is the recipe from James’ book Brilliant Bread that I have made successfully. Into the bowl of your electric mixer (I used my KitchenAid), rub the flours, yeast and salt, keeping the yeast and salt on separate sides of the bowl. Add the starter and water and form into a extremely wet dough. I followed James’ instructions for the electric mixer, here, although you could knead by hand for 10-15 minutes. Beat the dough with the paddle attachment of the mixer until it comes away from the sides and easily passes the windowpane test. Cover your bowl with cling film (I use a shower cap) and leave to prove. This can be 2 hour room temperature prove or leave for 10-12 hours in the fridge. The dough should have at least doubled in size. Turn the dough out on to a heavily floured surface. Using floured hands, fold the dough in half so both the top and bottom are both floured. Move it around a little to make sure the bottom is totally coated, and add more flour to the top. Flatten very gently into a rough rectangle, then cut into 4 strips, being very careful not to deflate the dough and lose those bubbles which will be your holes! Gently transfer each strip onto a heavily floured tea towel. As you move them, stretch them out until they are long and “slipper-like”. The loaves don’t need to be exact they are after all rustic loaves. Leave to prove on the tea towel for about 1 hour, or until wobbly and noticeably increased in size. About 40 minutes before you bake, preheat your baking surface in the oven set at 240 degrees C or 220 degrees C fan forced. Turn the ciabattas (be very gentle) on to a board dusted with semolina, so what was the bottom is now the top – this helps to redistribute the bubbles for a better crumb. Slide the loaves on to the hot baking surface and throw 1/4 cup of water on to the sides of the oven. Bake for 15-20 minutes, until golden brown. (I think I could have baked my loaves a little longer – they were not brown enough). Posted in Bread, Fish, Healthy, Vegetarian and tagged Brilliant Bread, hot smoking, James Morton, Kitchenaid, rustic bread, sourdough starter. Bookmark the permalink. I started this lovely loaf by putting the ingredients together and leaving to prove in the fridge. To bed at 4.00am, up at 10.00am with the dough ready for its next stage. I ended up with a beautiful, festive loaf for breakfast. The inspiration for the bread was a Nigel Slater recipe for rosemary and honey bread, and the method from James Morton, who really “gets” bread. Rub the flours together, add the salt and yeast, keeping them separate. Add the warm water, honey and the sourdough starter (if using). Stir in the cherries, raisins and walnuts. Use a dough scraper to combine into a loose dough. You should have a dough that is really quite sticky. Once combined, use the scraper to pull the dough from the edge of the bowl into the middle. You should then work your way around the bowl several times, about 15-20 scrapes. Cover the dough in the bowl with a plastic bag or a plastic shower cap, which I find ideal. Rest the dough for an hour until risen and spongy or in the fridge overnight for a retarded prove, which is what I did. Preheat the oven to 220 degrees C. Heat a baking tray or slide in the oven. Turn the dough out onto a floured surface and then carefully transfer to a proving basket or a floured tea towel inside a bowl. I love my proving baskets and the rustic markings they leave on the bread. Leave to prove for about an hour or until nearly doubled in size again. This next part you need to do quickly: open the oven door, pull out your baking tray part way and deftly turn out the dough from the proving basket onto the hot baking tray. Score the the top of loaf. Add a shallow pan of water to the bottom of the oven (to create steam for a lovely crust) and close the oven door! All this should take about a minute – you don’t want to lose heat from the oven. Bake for about 25 minutes, or until nice and dark brown. Remove from the oven and transfer to a wire rack to cool. You can eat this fruity bread on its own, with butter, with cheese or with something a little indulgent like lemon curd. This was a great pick-me-up on January 1st! Posted in Bread, Breakfast, Vegetarian and tagged dried fruit, James Morton, Nigel Slater, nuts, proving basket, sourdough starter. Bookmark the permalink. I am still cooking from James Morton’s book Brilliant Bread. James is the most common sense baker around and his recipes really work. This time, I tried his Super-Fast Brioche and it was pretty fast. From mixing to eating in half a day. I tweaked the recipe a bit and made a lovely Christmas version with sour cherries and cranberries. And as the dough is a bit tricky to use as it’s really sticky, I put the first prove in the fridge to make the dough firm up and make it easier to handle. You can also make a normal brioche loaf without the fruit and spices. The texture was incredibly light and airy, somewhere between cake and bread. Which make sense of Marie Antoinette’s “Let them eat brioche” – not cake as the popular saying goes – Qu’ils mangent de la brioche“. And I used my wonderful sourdough starter, going strong after 6 months! 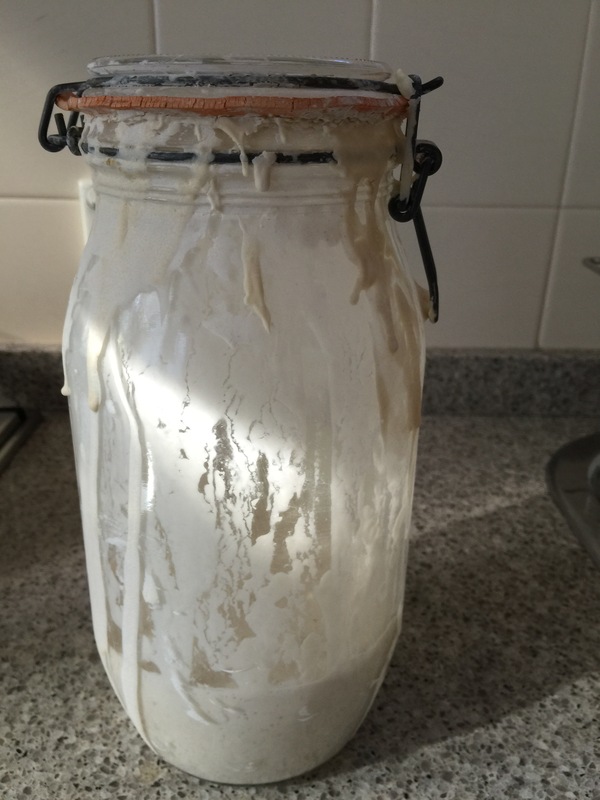 I cannot recommend highly enough using sourdough starter in bread recipes where instant yeast is also used. Preheat oven to 220 degrees C, 200 degrees C fan-forced and very heavily grease (with butter) and line a loaf tin. Using a wooden spoon or electric mixer, beat together all dough ingredients except the butter. (I used my KitchenAid with the dough hook.) Keep beating very vigorously – probably around 5-10 minutes – and you can see the dough become more elastic and stringy. If you are very competent with dough handling, you can attempt some stretches and folds. Beat in the butter until fully incorporated and the dough is totally smooth, another 5 minutes. 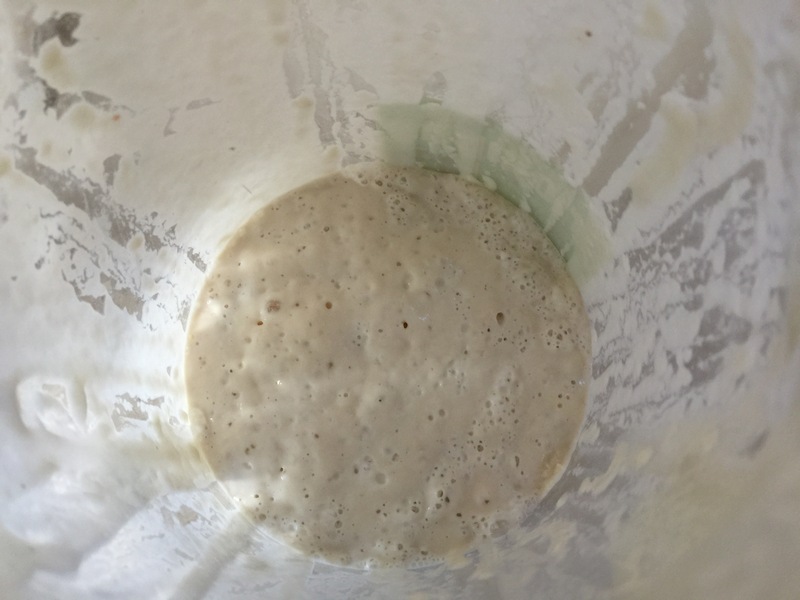 You will notice the dough change – it will become firmer. Using hands or a dough scraper, fold the dough over into the middle of your bowl, tightening it. Cover and rest for 30 minutes at room temperature. Using your hands or a dough scraper again, fold the sides of the dough into the middle, working your way all around the bowl several times. You will see the dough tightening – you want to help it hold its shape at the end. Cover and prove the dough for at least 2 hours in the fridge. Remove from the fridge and get ready to shape. The dough should have firmed up enough to shape it into a loaf to go into the tin, for a regular brioche, or roll it and fill with fruit and spices and then shape for a Christmas version. For regular brioche, fold the dough into a loaf shape and put into the buttered tin. Be careful with handling – it’s still a fragile dough, even after being in the fridge. For Christmas brioche, put your chilled proved dough onto a floured board and gently stretch to a rectangle. Don’t go too thin – just stretch the dough large enough to be able to fold it over a couple of times with the filling. Scatter the cherries and cranberries and spices onto the dough then fold over 1/3 from the top, and then fold the dough over onto the remaining 1/3 of the dough. Carefully transfer to the very well buttered tin. Prove for a final 1 hour. The dough should be light and fragile, but springy on top when prodded. Eggwash the top of the loaf, and turn the oven down to 200 degrees C, 180 degrees C fan-forced, and bake for 40 minutes until dark brown on top. When cooked, cool in the tin for for a few minutes, then carefully turn out onto a wire rack. It should be OK, but you may need to ease the brioche out of the tin, as this dough can sometimes stick. Fingers crossed! Let cool completely before eating. I served my brioche plain with butter, and with Christmas jam* and natural yoghurt. When the brioche was a couple of days old, I toasted it and served it with vanilla butter (unsalted butter whipped with icing sugar and vanilla paste) and Christmas jam*. *Christmas jam is made with fresh or frozen cherries and cranberries, and sugar and water as in normal jam recipes. Posted in Bread, Breakfast, Cakes, Dessert, Jams, Marmalades, Conserves and Chutneys, Sweet Food and tagged bread, Brilliant Bread, brioche, James Morton, sourdough starter, sweet bread. Bookmark the permalink.